Do you know how many uses there are for a luffa sponge? If I’m being honest, I started growing luffa sponges because I found this article and no other reason. When I started harvesting luffa sponges, I had no idea what to use them for. Here are few uses for luffa sponges. This might be one of the most popular uses for luffa sponges. I’ve never made soap, but when I do, I plan to put it into a luffa sponge! I haven’t started “shopping” around for the best soap recipes yet, so if you have one please drop it in the comments below! One day I plan to add goats to our little homestead, so I’ll be making goat’s milk soap. You just pour the soap over the luffa sponge and then you have a soap/sponge duo ready to be bathed with! This is the first way I used my luffa sponges. Using your dish sponges is so yesterday, Y’all. I mean, can you compost your dish sponge when it’s too far gone? I CAN! The first time I used a luffa sponge to wash my dishes, it exceeded all my expectations. My thoughts were that it would either be too stiff and scratch my sub-par fiesta ware or too soft to do anything right. Nope! While doing dishes, they get just soft enough to wash the dishes with no markings. They stay just stiff enough to scrub the nastiest dried food off the plate. Paired with my Mrs.Meyers eco-friendly soap, I know there are no chemicals going down my drain. Cleaning with a luffa sponge doesn’t stop at your dishes! 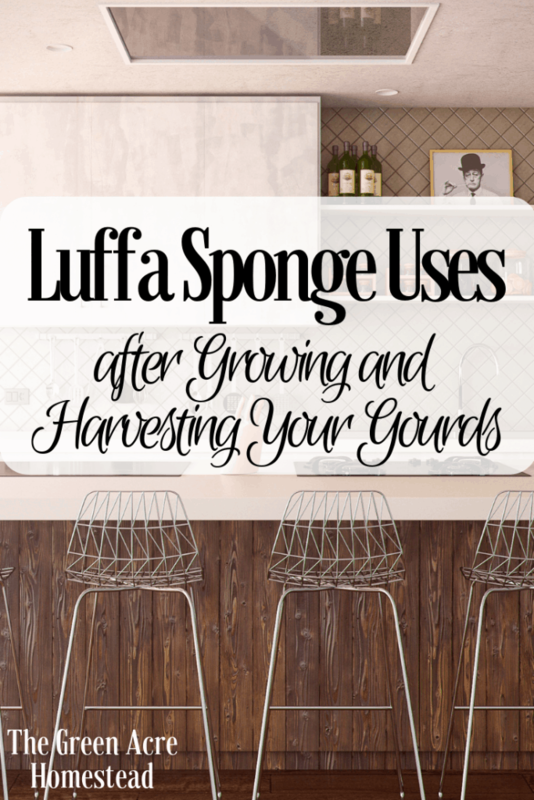 I use a luffa sponge to clean my kitchen counters, bathroom counters, and even my toilets! Just make sure you put that one in a very specific place. Mark it so you don’t use it later on your dishes…or your face. Luckily, I’m not speaking from experience. EW. I don’t exfoliate my skin enough. Lately, I’ve added exfoliation into my evening routine about once a week or so and it’s so nice. My lips get really chapped so I mainly focus on exfoliating my lips. After exfoliation, I wipe my face with Desert Essence Tea Tree Oil wipes and moisturize with Jojoba Oil (4-5 drops) and Lavender Essential Oil (2-3 drops). Sometimes I also add Bergamot! Erin from The Tannehill Homestead mentioned she likes to use lavender on her face because floral oils have an anti-aging benefit. I took her advice and LOVE LOVE LOVE it. The lavender oil also helps me sleep at night due to its relaxing property. Long story short, my nights are wonderful due to luffa sponges and Simply Earth Essential Oils. Your first thought after seeing my feet would be “that lady really needs a pedicure”. If you want to Paypal me the funds, you can send them to thegreenacrehomestead@gmail.com! I’m kidding! I’ve been exfoliating my feet with a luffa sponge and it really does the trick! My calluses are like WOAH. I should start offering exfoliating pedis as a #sidehustle. I DO know people who never ever wipe anything out of their cast irons. EVER. I don’t clean my cast iron after very use, because yesterdays bacon grease is fine with me! My cast irons are cleaned every week or two and I’ve had the same ones for years. There’s a taboo that you can’t clean a cast iron because it’ll rust immediately or ruin it. That’s not true. Anyway, my luffa sponge works wonders on my cast iron! I’ve stopped using my little bristle sponge and started strictly using my luffa for my cast irons. Get to Using Those Luffas! Luffa sponges are such a great, sustainable way to clean your home and so many other things. Once you’re done, you can compost the luffa sponge and move forward with another one. I’ve been using the same luffa sponge for about 3 months now and it’s still holding strong. Have you ever grown or used luffa sponges? Drop a comment below! Great information!!! I recently bought some to dip and make bath scrubs! On my list anyway! Great idea for cast iron skillets! That sounds great, Pame! And thank you! Thanks for stopping by my site and I hope to see you again!